Warning! Versions 1.1.0 and above are not compatible with previous versions of the application. You will not be able to connect to computers with the old version of the application. Address book compatibility is preserved, but you must follow the steps below. Warning! Starting from version 1.1.0, the client part (console) and server (host) are separate and have individual installers. You need to transfer all address books to the “No encryption” mode before installation. Uninstall the old version of Aspia. Install the new version of “Aspia Console”. After installing the new version of Aspia, you can enable address book encryption. The installation program “Aspia Host” comes in the form of a package for Windows Installer (* .msi). 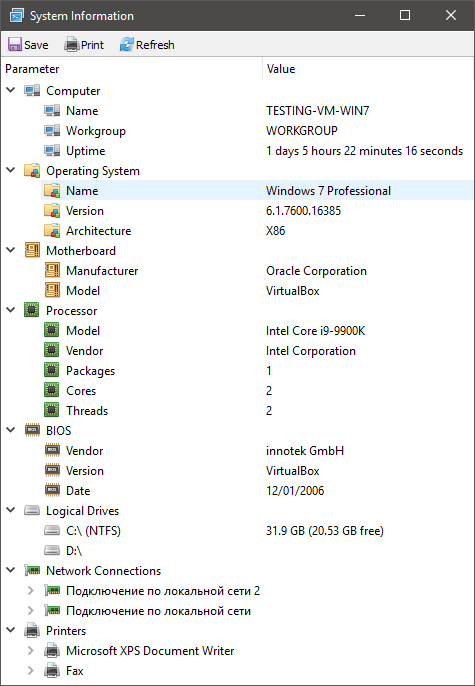 The installation language is determined automatically based on the current Windows language settings. It is possible to automate the installation and initial setup. When installed on other computers, the parameters from the file will be automatically imported. To manage the settings, you need to run the Aspia Host Configurator. The configurator contains several tabs that allow you to configure all supported parameters. Import and export settings allow you to save the current configuration to an XML file for later recovery (for backup purposes) or automatic deployment. Import and export of parameters can be done through a graphical user interface and from the command line. 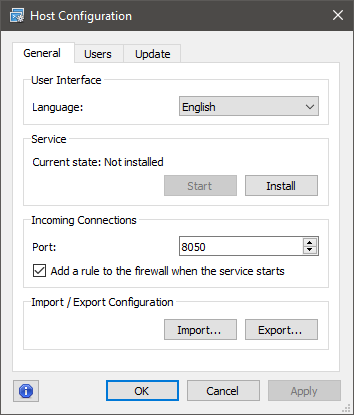 To perform import and export via a graphical interface, the “Export” and “Import” buttons in the “Aspia Host Configurator” tab in the “General” tab. To manage users, you need to run the Aspia Host Configurator and go to the “Users” tab. To add a user, click on the button with the icon . To delete a user, use the button , and to edit button . 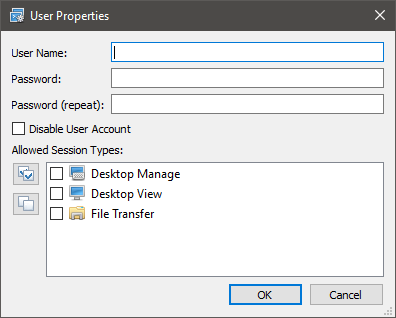 When adding a new user, you need to enter a username and password, as well as select the types of sessions that this user can connect to. Warning! When you change your username, you also need to re-enter the password. It is possible to check for updates and perform the update directly from the user interface. To do this, run the Aspia Host Configurator and go to the Update tab. To check for updates, you must click the “Check for updates”. A dialog to check for updates will appear. If an update is available for your version of the application, the update version, a link for manual download and a description of the update, and the button “Update now!” will become active. When you click on the update button, it will be downloaded and automatically installed. You can also specify your own server to check for updates, if for some reason you are not satisfied with the default server. Warning! When performing an automatic update, the application will be closed. All unsaved data will be lost. All connected sessions will be completed. After the upgrade is complete, you will be able to connect again. Address book is used to perform a quick connection to computers. You can add computer groups, computers, manage connection settings to computers. Address book can be encrypted and not encrypted. When you open an encrypted address book, you must enter a password to access it. Warning! When storing passwords in your address book without encryption or with a very simple password, you need to understand that this is a potential security risk and third parties can access the management of computers from the address book. Address books open in the Aspia Console and are tabs. You can create multiple address books and open them simultaneously. 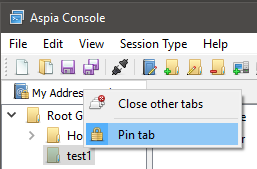 You can also use the option to “pin” tabs with address books. To do this, click on the tab title with the right mouse button and select “Pin tab”. Pinned tabs will automatically open when the application starts. To organize computers is convenient to use groups. You can create an unlimited number of groups of varying degrees of nesting. 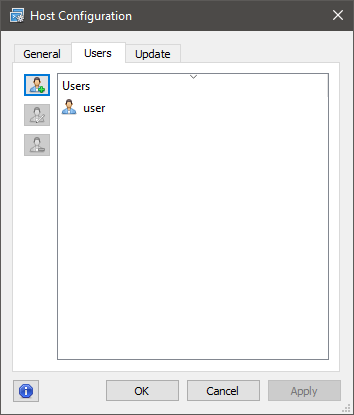 To add, change and delete computer groups, use the corresponding items on the toolbar or in the context menus. Name The name of the computer group. The field is required. Comment Freely editable field for making notes. Not required. 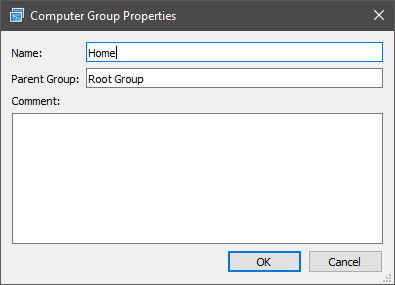 To add a computer, select the group to which you want to add it and click “Add Computer”. To change a computer, right-click on it and select “Change Computer”. 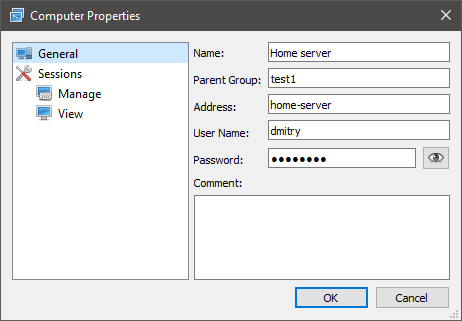 The computer properties dialog opens. Name The name of the computer. It is required. Address Address of the remote computer. It is required. 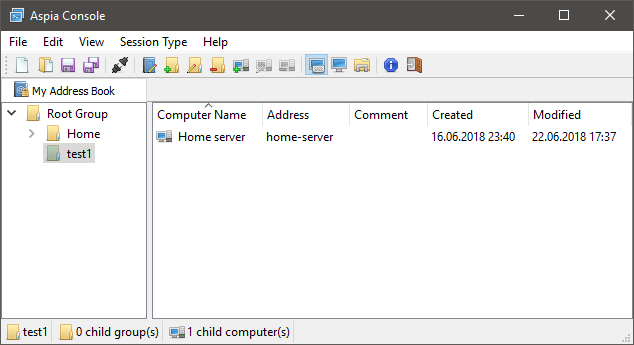 User name Username for connecting to a remote computer. Not required. If the field is empty, then a login dialog will be displayed upon connection. Password Password to connect to a remote computer. Not required. If the field is empty, then a login dialog will be displayed upon connection. If you need to specify a port for connection, then this can be done by specifying it through the “:” symbol after the address. When you connect to desktop management, a toolbar appears at the top of the window. Lock toolbar If the button is clamped, the toolbar will always be displayed. Otherwise, after a few seconds after moving the mouse pointer outside the panel, it will be hidden. Setttings Invokes the dialog to change session parameters. Select monitor Allows you to switch between displaying individual monitors or the entire desktop. Only displayed if there is more than one monitor on the host side. Power management Allows you to shut down or restart the computer, end or block a user session. Отправить Ctrl+Alt+Del Отправляет соответствующую комбинацию клавиш на удаленный компьютер. 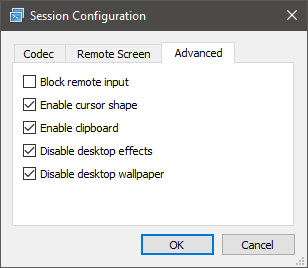 Automatic window size Changes the window size to the optimal one based on the size of the monitors of the remote and local computers. Full screen Switches the control window to full screen or returns the original state. System information Displays a window with information about the remote computer. 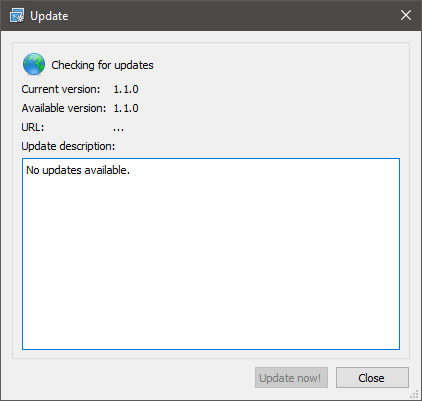 Remote update Runs an application update on a remote computer. Displayed only when the host version is smaller than the console. Extended menu Displays an advanced menu of advanced features. Scaling an image When you enable this feature, the image of the remote desktop will fit in proportion to the window size. Automatic scrolling When this function is enabled, the desktop image will automatically scroll when the cursor approaches the window borders. Send key combinations When you turn on this feature, system key combinations will be automatically intercepted and transmitted (for example, “Print Screen”, “Win”, “Alt + Tab”). Save screenshot Save a snapshot of the remote screen to a file. Codec You can choose which codec to use. There are 3 options available: ZLIB (default), VP8 and VP9. ZLIB is well suited for slow connections, allows you to specify the color depth and level of compression. VP8 and VP9 are video codecs and are well suited for fast connections. Color depth Sets the color depth. The smaller the color depth, the less data will be transmitted over the network. This parameter is available only for ZSTD codec. Compression level Sets the level of compression. The higher the compression level, the less data will be transmitted over the network. Setting higher levels of compression may result in lower coding rates. 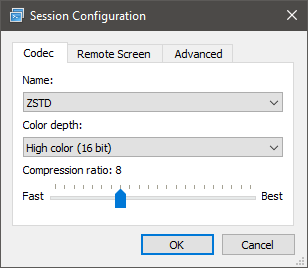 This parameter is available only for ZSTD codec. 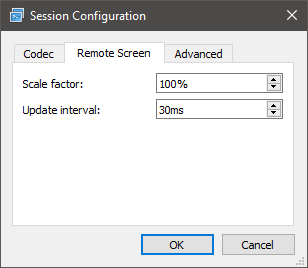 Scale factor The scale of the remote screen (the image is resized on the host side, the amount of data transmitted over the network will be reduced proportionally to the decrease in scale). Update interval Specifies the time interval at which the host will seek to update the desktop image. Block remote input The user of the remote computer will not be able to perform input through the mouse and keyboard. However, the Ctrl+Alt+Del key combination remains available. Enable cursor shape When enabled, the local cursor takes the form of a remote one. Enable clipboard When this option is enabled, the automatic exchange of the clipboard between the local and remote computers will occur. Disable desktop effects When enabled, desktop effects (such as animation, smooth scrolling) will be disabled for the duration of the connection. Disable desktop wallpaper When enabled, the desktop wallpaper will be disabled for the duration of the connection. Allows you to view basic information about the remote computer. The resulting information can be saved to an HTML file or printed out on a printer. Double-clicking on any line with information about the system will be copied to the clipboard. In the context menu, you can selectively copy the name of the parameter, its value or a string in its entirety. Allows you to transfer a file between local and remote computers, delete, rename files, create directories. When connected to a remote computer lists of disks are displayed that allow you to estimate the amount of free space on them. The Aspia Console supports command line operation. You can connect to a computer or open the address book file by executing the appropriate commands. Warning! Passing a password through command line parameters is a security risk and is not available. It is possible to check for updates and perform the update directly from the user interface. 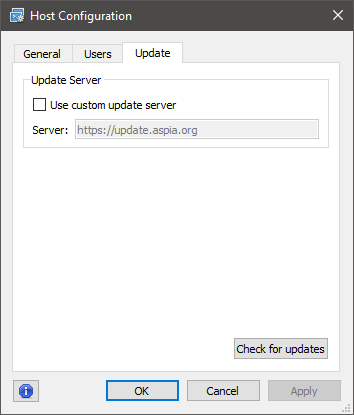 To do this, launch the Aspia Console and select the “Check for updates” item in the “Help” menu. A dialog to check for updates will appear. If an update is available for your version of the application, the update version, a link for manual download and a description of the update, and the “Update now!” button will be displayed. will become active. When you click on the update button, it will be downloaded and automatically installed.